Colored Pencil Drawings | Who Are You Calling Crafty? I have recently been entering my Colored Pencil Drawings in a monthly Challenge put on by Colored Pencil Magazine. I have entered four so far, I haven’t won anything which is fine because I didn’t enter to win, I have entered them to keep myself motivated and to explore Colored Pencil once again. When I say colored pencils I am not just talking about Prismacolor, Polychromes or Soho Colored Pencils, I am speaking of Watercolor, Inktense and oil pencils as well. 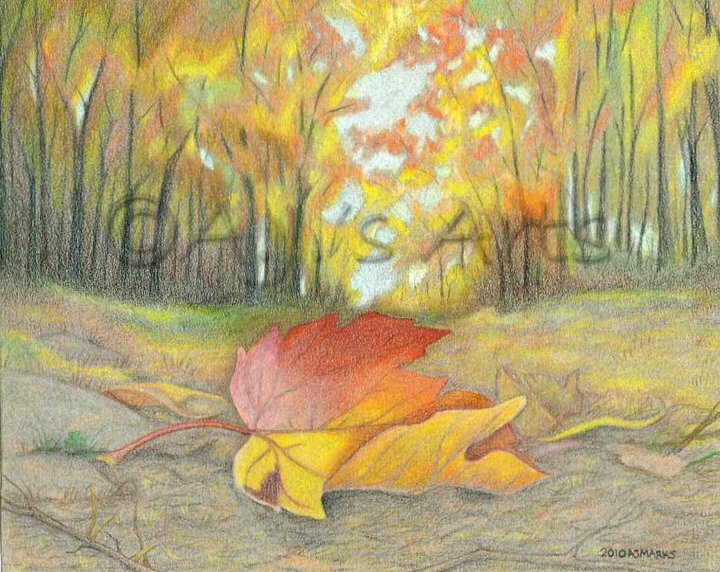 My first colored pencil class was in high school, I took a private class from an amazing artist named Gail Stanek. I am not going to lie I thought she was crazy for one drawing so large and two spending so much time on one drawing. I can say I enjoyed colored pencil drawings but I didn’t love colored pencil drawings because of the time they took. Over the years I have revisited colored pencils and it wasn’t until recently I realized what I was missing out on; the relaxation and calming effect that comes from drawing with pencils. At first it was nice to be drawing again and then it was more, how can I get it darker and more depth and now it is I want to go bigger, much bigger. I don’t draw or paint big I am a small kind of gal, 8″x10″, 11″x14″ and maybe an 18″x24″ but never any larger. For me small has sold (8″x10″ or 11″x14″) not many people have room for a 18″x24″ or larger piece and shipping something like that is really expensive. I then decided to take the plunge with a big color pencil drawing 30″x22″ most color pencil artists work around 11″x17″ (A3 size). I worked on this drawing only after my children went to bed at night. Booga saying.”Let me get my dot markers and help mom.” Made the drawing disappear very quick. The drawing itself took over 120 hours to complete, which I can say is the longest I have ever spent on any piece of art. I would also venture to say it is the best drawing I have ever done which is saying something because I have had some really good drawings over the years. This is the color pencil drawing I just finished yesterday. 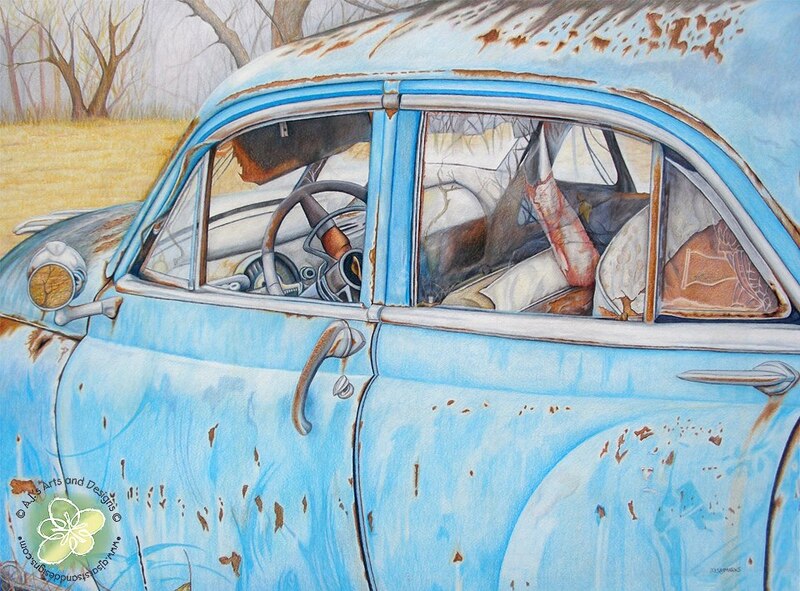 This is the Rusty Blue Car 30″ x 22″ drawing I just finished. Practice and patience is key, I think with colored pencils the more you practice the more patient you become. I easily could have stopped at any time and given up but I some how saw it through and am officially hooked on color pencil drawings. The knowledge I gained from staying the course with this drawing is something that I could never be taught, I had to discover it for myself. I have never been one to shout from the roof tops about my skills and what I can do as an artist. I never wanted to seem too arrogant about my abilities as an artist. I grew up in a small town and entered far more competitions than I care to list, I have won and lost far too many to count. I am of the opinion there is always someone out there who is better than you and if you loose that, Karma will come to remind you of that. I was taught that art or the process should be done almost in secret, no showing until the piece is finished. Going to art college forced me to show my unfinished pieces to everyone, much to my horror and embarrassment I am grateful for that because art and the artistic process should be shared not locked away. Every artist has their own way of creating and as an artist I love seeing progress photos of someone else’s thought process. If you want to see my process check out my Facebook Album – Rusty Blue Car Work In Progress. I am very happy to be creating again, I did feel like I was in a slump but I think I found my creative groove again. The higher your bounce rate the further down the search results your posts and pages will end up, so having reasonably low bounce rate is important for improving your rankings naturally.